I’m 71 and working with Team Gleason has re-energized me because I know we’re helping so many people. 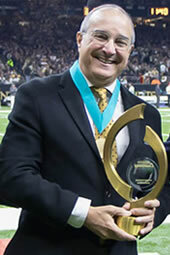 On October 26, 2011, at age 65, Paul Varisco co-founded The Gleason Initiative Foundation, better known as Team Gleason. Formed only months after his son-in-law and former player for the New Orleans Saints, Steve Gleason, was diagnosed with amyotrophic lateral sclerosis, or ALS, the nonprofit has since raised an unprecedented amount of awareness for the disease – not just in New Orleans, but around the world. Raising global awareness helps fuel a search for solutions and an end to the disease, but the foundation is also driven to provide short-term, immediate help for people with ALS. Team Gleason works with technology giants to innovate solutions in assistive equipment and has funded over $3 million in equipment and services for people with neuromuscular diseases. Not only does Team Gleason work to provide tools for a better life for people with ALS, the foundation facilitates adventure travel to show people with the disease that they don’t have to just fade away – that they can do more. Few people could do more than Paul to build and direct an organization like Team Gleason. Paul has spent his life establishing relationships. From his rock-band days in the 60s (Paul Varisco and the Milestones still get together to play) and his career in sales for a high-end local clothing retailer to his ownership of businesses, his service on various civic-oriented boards, and his Friday lunch maitre d’ work at a popular St. Charles Avenue restaurant, Paul has developed an effortless ability to connect with people – including some of the most influential people in New Orleans. Everyone seems to know and like him. As such, the launch of Team Gleason wasn’t just backed by vision; it was supported by experience and a network of connections that touched nearly every area of expertise the foundation needed. That network continues to grow and to drive the success of the foundation. Paul Varisco … Peoples Health Champion.